Jeanne Whitby has provided this photo, which has been scanned by Diane Lockie. 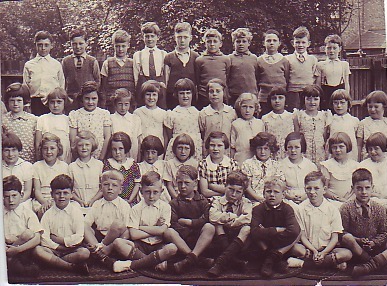 Jeanne thinks it is from 1938/9 and it shows children from St George's C of E School. The front and back rows are boys, with two rows of girls between them: 19 boys and 23 girls, a class of 42 in all. The teacher is not included. It looks like a summer's day from the short-sleeve cotton dresses worn by many of the girls, although some of the boys wear a jumper over their shirt. The school was at the junction of Clayponds Lane and Green Dragon Lane and closed in 1978 (Q103: includes the history of other Brentford schools). Jeanne has provided many names, see below. Front row: Robert Lynch, Derek Kennerson, Roy Pishorn, Roy Sayers, Billy Meade, Jimmy Passey, Ronnie Bradford, Ronnie Luffram, --?, Wallace. Jane wrote in February 2014: Joan Burwood (sister to my grandfather Stan Burwood) was married to Ernie Baker who worked at Brentford Market and her son now has the fruit and veg stall at Chiswick. Ernie died a few years ago and Joan lives in Surrey with her daughter now and still keeps in contact with my nan. Helen (Ashby) Shepherd wrote in October 2012: Pauline Daycombe was my auntie. Billy Ashby, top left, was my dad - he was born on 3/3/33. Pauline married his brother Arthur Ashby, who was four years older.